The Short Holes; Grand Vistas and Plenty of Challenge. 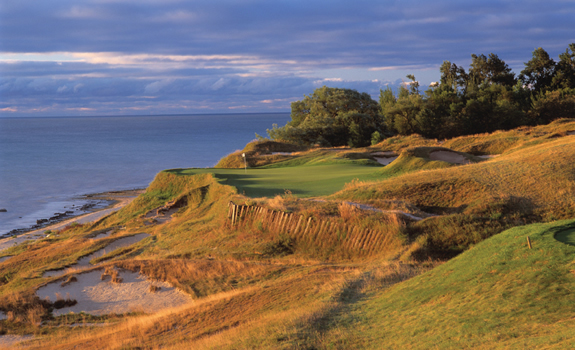 The most renowned of the four courses visioned by Herb Kohler and designed by Pete Dye as part of the American Club experience is the Straits Course at Whistling Straits. 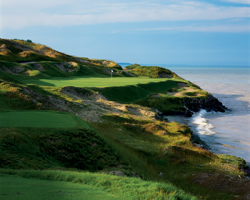 Home to the 2007 USGA Senior Open and two PGA Championships, 2004 and 2010, as well as the future host to the 2015 PGA and 2020 Ryder Cup Matches, the Straits course can boast a resume comparable with many of the most elite layouts in the US. Built from scratch on the shore of Lake Michigan, Dye created a stunningly visual trek along the shoreline, over Irish style seaside dunes and between what seems thousands of bunkers. Many will remember Dustin Johnson’s encounter with one of those devils in the PGA. This behemoth plays long, demands excellent shot making and precision to have a chance. This “bucket-lister” is as unique an experience as you will find anywhere. The Straits are famous for the seemingly endless bunkers and high fescue covered dunes. Players are also graced with a series of toughies at the stunningly beautiful shoreline holes. 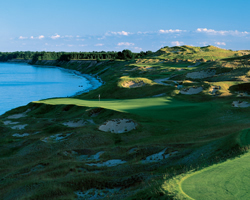 With eight holes edging the sparkling Lake Michigan, there is no shortage of vistas to help you forget that this course is going to beat you up if you aren’t careful. Hole 3 named "O'Man", is the first taste playing into the prevailing wind and presenting a massive ridge in the center of the green protecting a back left pin. The seventh, "Shipwreck", plays downwind as a long iron or hybrid hit true. "Pop Up," Hole 12 plays as the easiest and shortest, but don’t be fooled as it is downhill to a most severe green that meanders in all directions and slopes. The final short hole Number 17, "Pinched Nerve,"is a beast of a challenge requiring a long iron or more likely fairway wood or driver to get home over the fall-off full of bunkers and trademark railway ties.